dlabrecque wrote: Are you certain you're sending a clean tone into the amp? Have you tried it with several different guitars? I've tried all the things you wrote. Obviously, no pedal was connected in the input. All guitars are with passive guitars. Also, I've tried with single coils and humbuckers: always the same result. The "overdriven" sound you can ear pumping up the master on the channels, with the loop on, is really unnatural. So it makes me think about a broken thing into the amp. I'd forgotten that the fuzzy sound was only with the loop engaged. That eliminates the possibility of the problem being at the input. Sorry. Sure sounds like something's broken in the amp. I'd think your best bet is to take it into a good, local guitar amp technician. I'm trying to find a good local technician who has experience with Mesa products. In the meantime, I restored the parallel loop and all the transistors. By the way, the problem remains even with the parallel loop. I wrote to the Mesa Italian referent, in the meantime I'd like to try several things to see if the problem is in the loop, or in the preamp-power amp section. Do you think is it possible to use the "slave out" jack, instead of the send to use my pedals? Then, if not possible, I'll use it into another power amp section, like the "return" of my Marshall 6100. DS-1 wrote: I wrote to the Mesa Italian referent, in the meantime I'd like to try several things to see if the problem is in the loop, or in the preamp-power amp section. either the DUAL or TRIPLE RECTIFIER Solo Head as a master pre-amp, or additional power amps may be connected for more power when needed. Some players use this to derive an FX Send Signal and go to other amps for their wet sound. Since there's no way to get the signal back into the amp downstream from this point, you won't be able to get the signal to the power amp section. You could go into another power amp, if you wanted; that's what the jack is designed for. 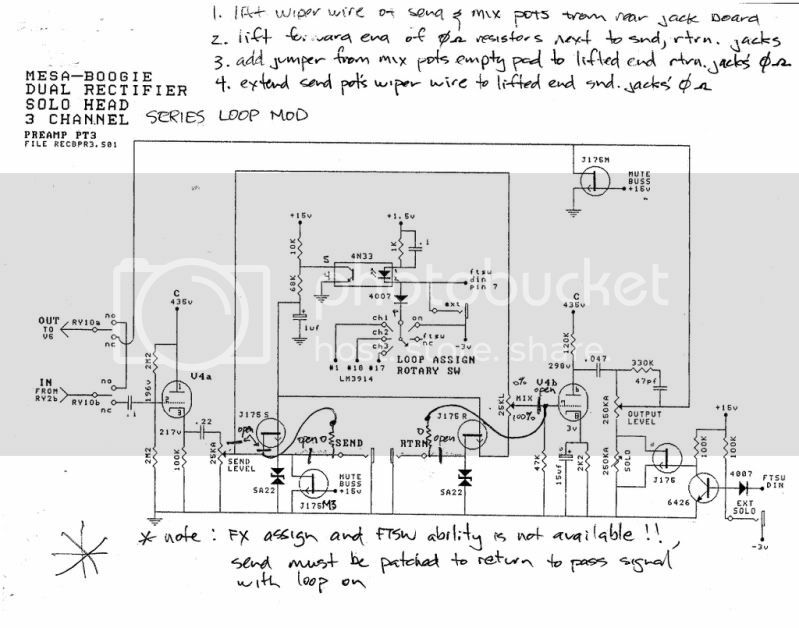 - "loop_on.wav" was recorded using the "loop on" position on the rotary pot from the back of the amp. I recorded the clips using the clean channel with all the knobs on 12 o'clock position. With the loop on, it doesn't matter how cranked was the OUTPUT knob. It always sounds like a overdriven/fuzzy channel. By the way, sorry for the bad quality of the clips, but I couldn't find my SM57, so I used a very cheap Sony mic. the mod are correct in this way? loop from parrallel to serial is simply to remove this wire? Last edited by Rickyfly on Wed May 04, 2011 12:06 pm, edited 1 time in total. The mod that I describe below is for a truly serial fx loop without any return or ground effects. Have anyone tried Rickys FX serial mod? It looks different from all others and sounds like the best solution. Can anyone clarify these statements? means that all functions of the pedal switches are functioning. unfortunately the only picture I took these I have already published. however, the change is simple! When removing Wire 1 from this photo... Do wires 2 and 3 need to be soldered together in position 2? Rickyfly wrote: The mod that I describe below is for a truly serial fx loop without any return or ground effects. Interesting, Can U show me the Schematic of this mod? mikey383 wrote: Those 3 three-pronged thingies are transistors. I suspect they are there to recover any gain lost from the loop. The 0 ohm resistors are those blue ones beside the jacks with the single black stripe. [EDIT]I removed the footswitch mod because I don't have the complete documentation. I have dual Rec 3 channel and wanted to know a definitive description to the correct mod which address the change of parallel loop to series loop as i have read through all the posts and im a little confused now to what one is the correct one. 1. what changes on the footswitch when the mod is done? 2. what changes to the controls on the back of the amp? 4. what are the results to the correct mod, is there still dry signal? 5. is there still level drop? i wouldnt need to turn effects loop on/off it would just be on all the time. mix jack socket left pin to pin 7 of valve? this i may have got wrong as im thinking it could also maybe from where the mix jack socket was attached to pcb that is ment to goto pin7 of the valve? this is not very clear in the picture exactly how to connect this all up. Ive wired it up how ive said and basically the footswitch doesnt work and i get very strange channel selections, with both clean and 2nd channel selected at the same time. I didnt leave the amp on for very long as didnt want to damage it but something aint right with it. please could someone advise me.